Summary: Something strange is happening at the Orsk furniture superstore in Cleveland, Ohio. Every morning, employees arrive to find broken Kjerring bookshelves, shattered Glans water goblets, and smashed Liripip wardrobes. Sales are down, security cameras reveal nothing, and store managers are panicking. 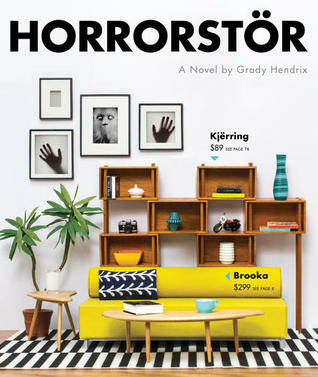 A traditional haunted house story in a thoroughly contemporary setting, Horrorstör comes packaged in the form of a glossy mail order catalog, complete with product illustrations, a home delivery order form, and a map of Orsk’s labyrinthine showroom [x]. Review: I absolutely loved this book. 2016 is looking great for my reading choices! I’ve already added two books to my favourites list this year! The beginning started off a little slow but as soon as it dived into the mystery aspect I honestly got creeped out. Like, the kind of creeped out when you’re watching a movie and hide your face behind a pillow (except my pillow was a page). I have to say that it is probably the first time I’ve felt that way towards a book. Granted I have only read a few “horror”/”paranormal” novels before. Not only was their a mystery/horror aspect but their was also some humor involved. If you’ve ever been in an Ikea or have worked some sort of retail in your life you will get a good laugh. Basil’s character is all about the job/company and lives and breathes “Orsk”. We all know people at companies like that and I think our reactions are Amy. Each chapter begins with a diagram on different furniture item at Orsk. These start off normal but as the book progresses the diagrams for the “furniture” get really morbid. Almost like torture devices. I have to admit I didn’t really notice at first then I had to double take on one page and I slowly crept back to each chapter beginning to read the new descriptions. It was a simple book but I believe the author chose to focus on style rather than substance which I am totally okay with. It was a beautiful book and I highly recommend. This entry was posted in book, book review, book reviews, books, horrorstor, review. Bookmark the permalink.